Mike Stuffler, the resident expert on flieger watches and a collector of pilots watches for over 40 years, had his entire watch collection stolen in London while he was stationed there in 2011. 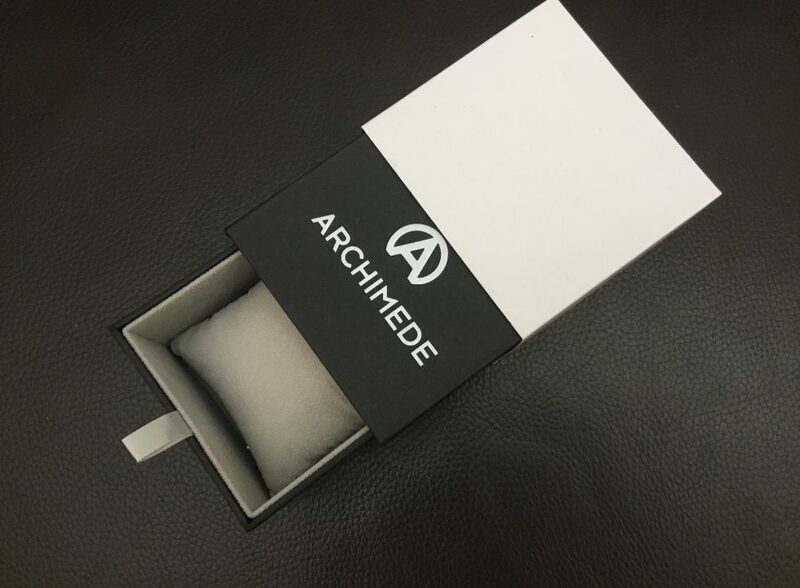 Two of the stolen watches were from Archimede. As he started to re-build his collection with Stowa, Laco, Damasko, G.Gerlach and Hanhart fliegers, the void for Archimede flieger still remained. Last year Mike and I visited Ickler manufacturer in Pforzheim and he was immediately sold on the Archimede Pilot 42 GMT. Mike received the watch this year and after wearing it few months, he has written a thorough review. Before we get to the review, let’s get to know Ickler manufacturer. 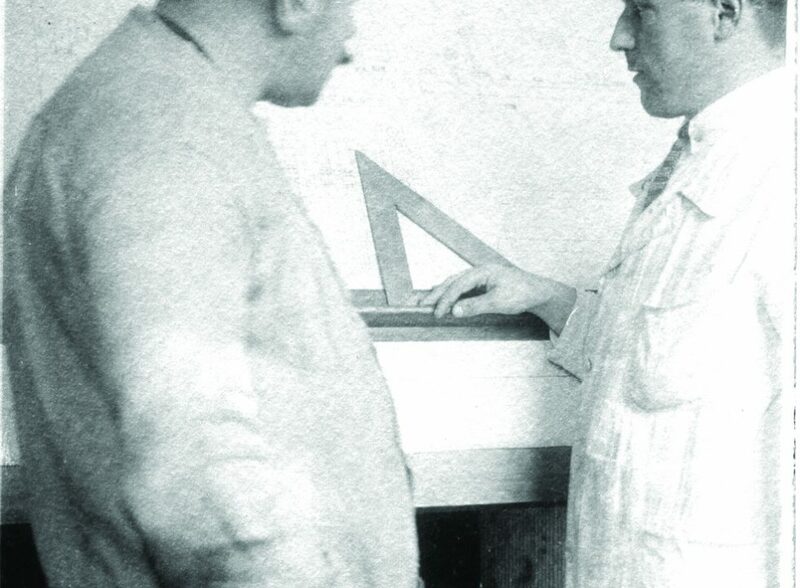 In 1924, Karl Ickler founded Ickler GmbH in Pforzheim, Germany. He had previously worked as head of the manufacturing department for foreign companies. After gaining considerable experience, he founded his own watch case manufacture. In 1947, his two sons rebuilt production, which was destroyed during WW II. Today the company is headed by the third generation – Thomas Ickler. Thomas relies on his daughter Lisa and son Raphael to manage the four brands – Limes, Autran & Viala, Defakto and Archimede. Ickler is well known for manufacturing high quality watch cases in Pforzheim workshop for international watch brands. The cases are crafted in-house, from solid blocks of stainless steel, bronze, pure titanium or 18 carat gold. Ickler uses the latest high-tech CNC machinery, which is guaranteeing ultimate precision. When it comes to polishing the surfaces, assembling parts and complete watches, and thorough quality control, Ickler relies on the careful human touch. Each watch made by Ickler is continuously quality controlled along every step of the manufacturing process. 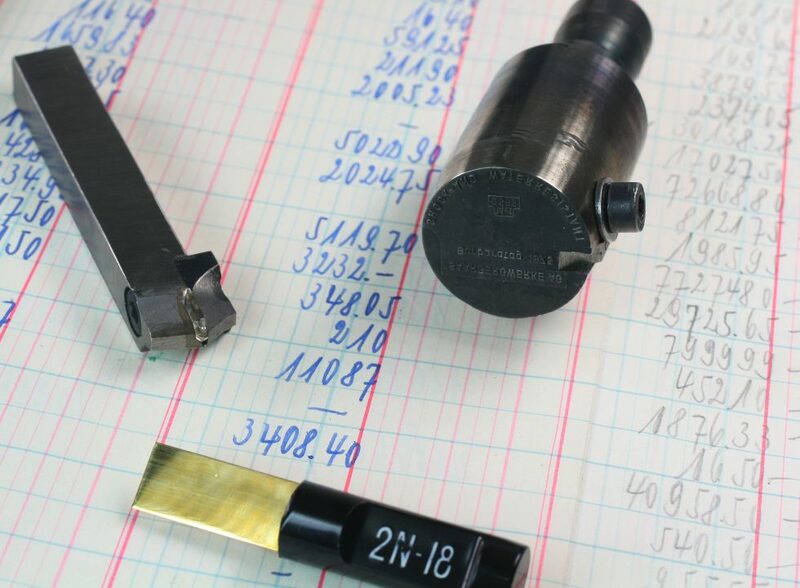 From turning and milling, to polishing and assembling of the multi-part cases, from the mounting of the movements, dials and hands, to the final quality check. Every watch is thoroughly tested before it leaves the factory, and it carries an international two-year warranty. 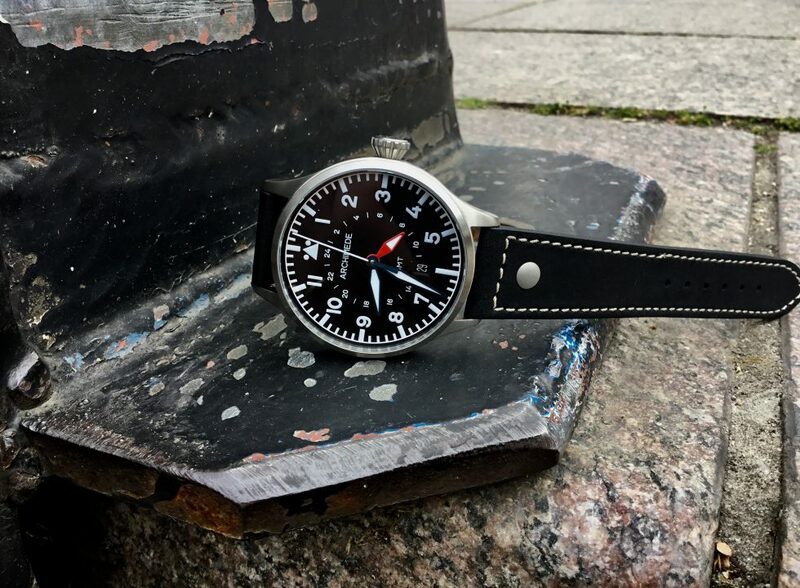 The interest in this affordable flieger and its reputation has not ceased since then. 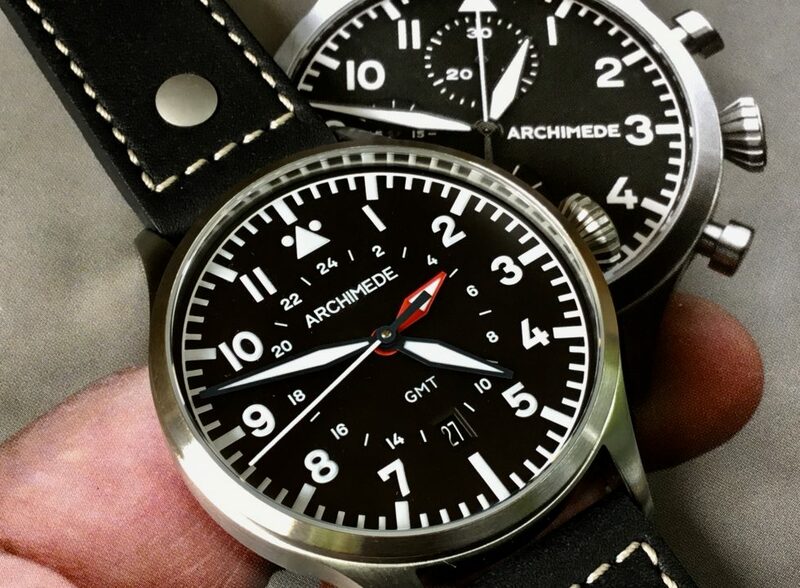 Archimede offers their fliegers in different case sizes, different dial variations, movements (automatic, manual and even historical movement like Junghans 687). 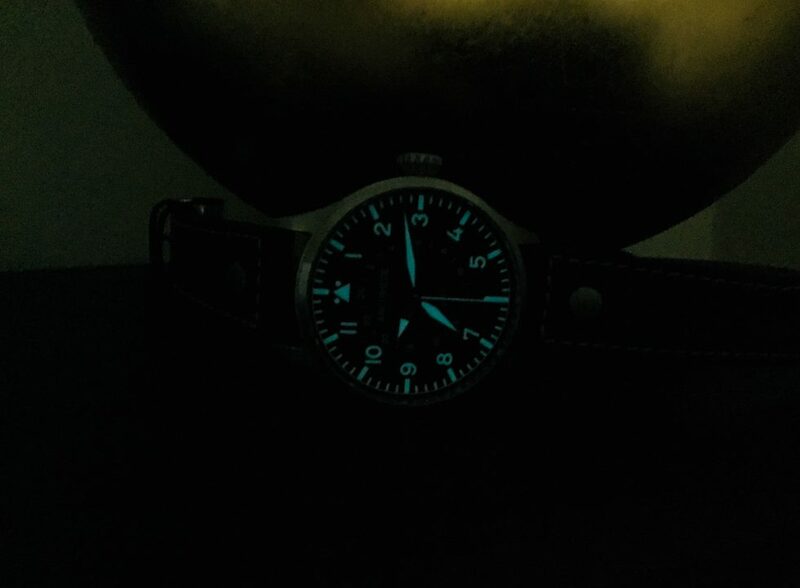 The Archimede Pilot 42 GMT is extremely legible in almost all lighting conditions. This is true for reading both the local and GMT time. 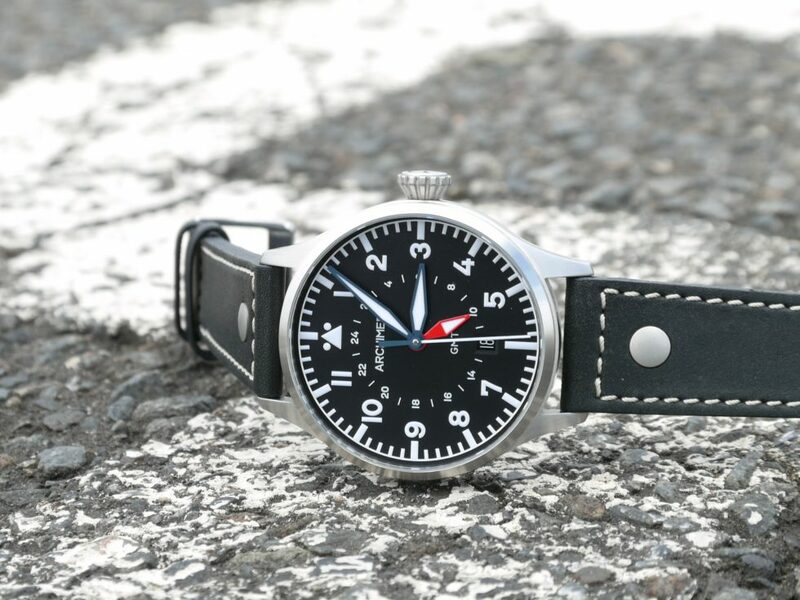 The dial is typical for modern flieger watches with a matt black color and white triangle at 12’o clock. Indexes, numbers, and all hands (including the seconds hand and GMT hand) are coated with BWG9 SuperLumiNova (white at daytime, blueish color in dark). The minutes track, markers, and numbers aren’t just printed onto the dial – they are all on a raised surface. The date is nicely integrated into the inner GMT hours ring with beveled edges. 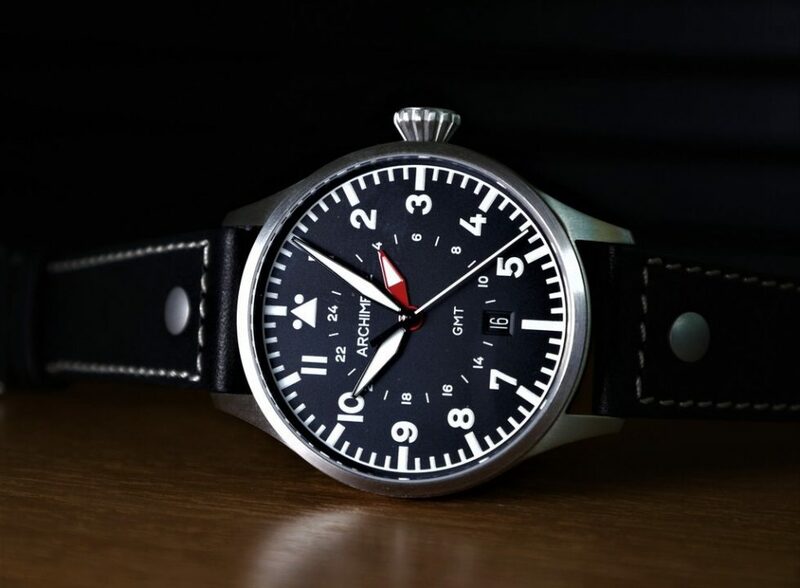 The shape of the hands is a homage to classic flieger hands, but unlike original flieger, the hands are fully coated with lume, down to the pivot. The GMT hand is shorter, red, and has lume only half-way, so it differentiates itself from the main hands. Reading the GMT time is very easy. Inside the main hours track is a small spartan 24-hour ring for the second-time zone, coupled with the watch’s only real splash of color. The hands all fit their purpose, the length of all hands is optimal. The seconds hand reaches the minute markers, the GMT hand reaches the inner ring. Same is valid for the minute and hours markers showing home time. Archimede offered their in-house manufactured thermally blued-steel hands in their Deck Watch models and a number of special editions. Now Ickler expanded their production capacities and offer these high-quality watch hands for the Pilot models as well. The crystal is a flat sapphire crystal with AR coating on the inside only. 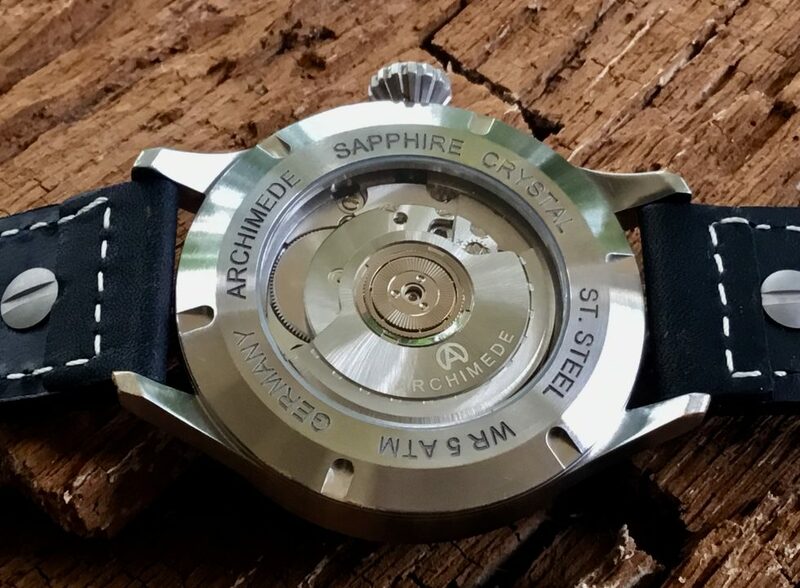 For additional €140 Archimede can install a domed sapphire crystal. Readability is perfect, and it should be noted that the crystal isn’t extremely prone to smudges and finger prints. 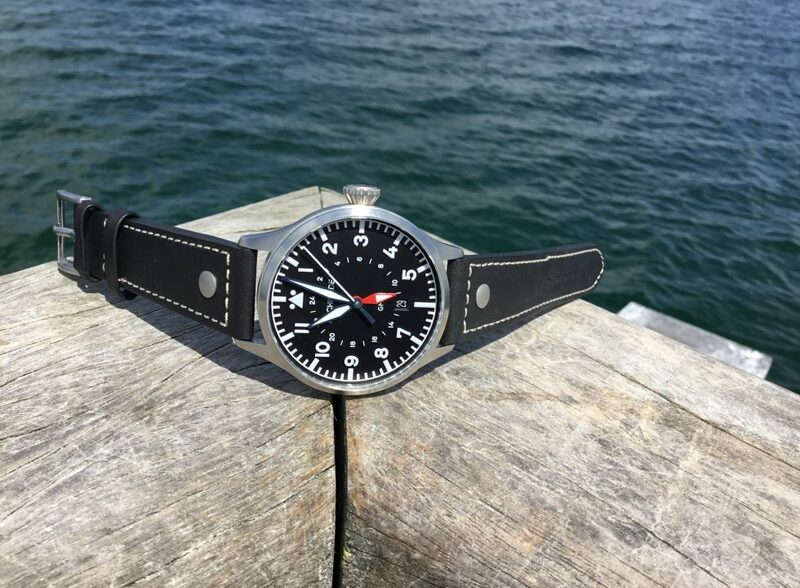 Archimede offers a wide selection of straps and bracelets for their Pilot GMT, including leather straps in black, dark and light brown, a brown velour strap, along with a choice of stainless steel bracelets (€140 stainless steel, €180 Milanese). I opted for the standard black riveted strap with contrasting white stitching. The strap is comfortable to wear and does not require a long break-in period. 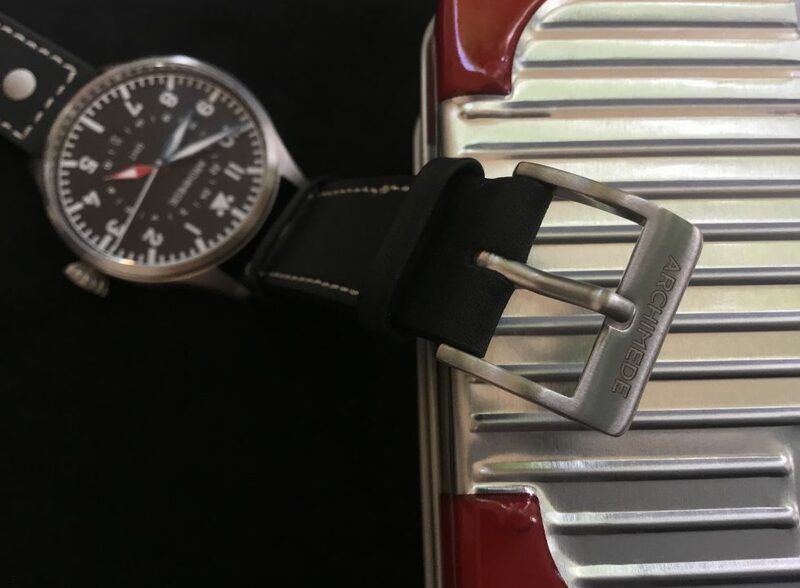 The strap is fitted with a brushed pin buckle and Archimede logo engraving. I am convinced that an aftermarket nato strap from Watch Bandit will be a good match as well. 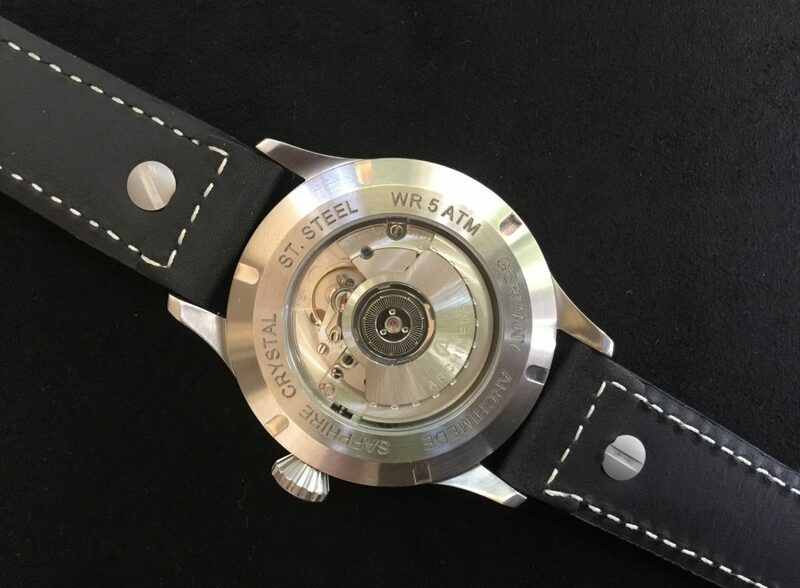 The Pilot 42 GMT is fitted with a standard ETA 2893-2 automatic movement. The ETA 2893-2 is known as a reliable and a workhorse used in several GMT watches for decades now. 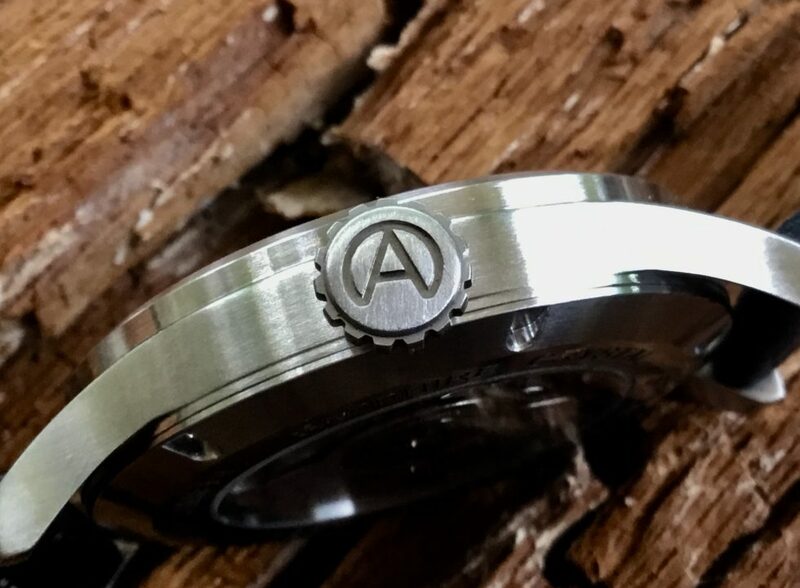 The rotor comes in a brushed finish with the Archimede name and logo. It would be too early to give a full report on the accuracy because I have not been wearing the GMT for an extended period. However, I am quite satisfied with its performance of about +4/+6 per 24 hrs with resting on the case back at night. The Pilot 42 GMT retails for €1160 (including VAT). 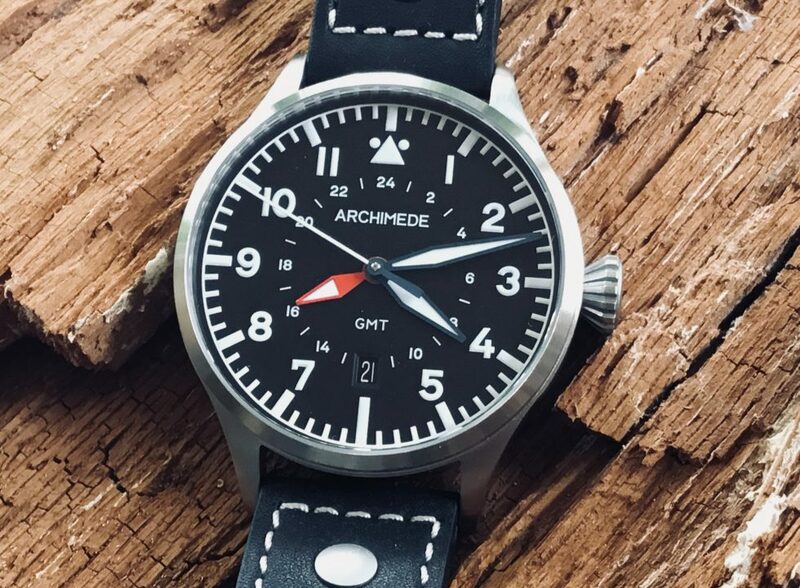 In summary, the Archimede Pilot 42 GMT, is a tough, reliable, good looking GADA (go anywhere do anything) watch proving a great bang for your buck. 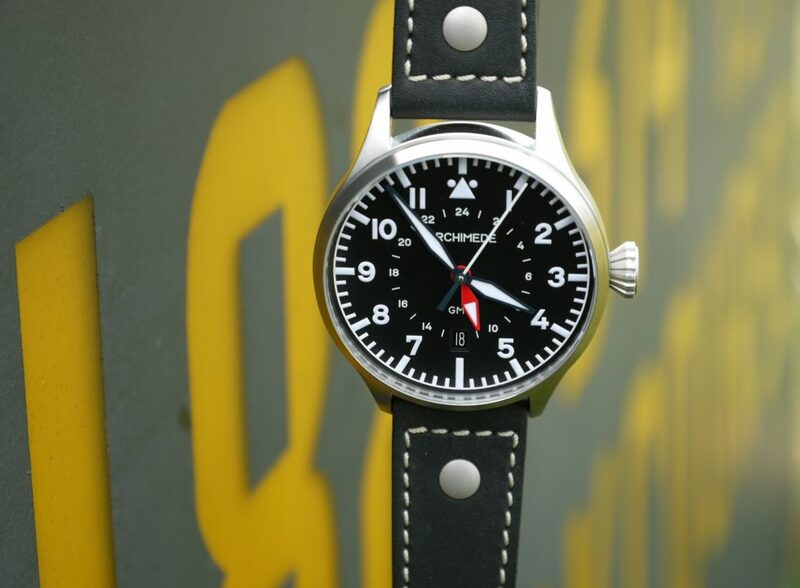 It’s not a true classic pilot watch, but nevertheless close enough to classic pilot aesthetics. Dial design and hands speak volumes; you can’t deny its flieger lineage. 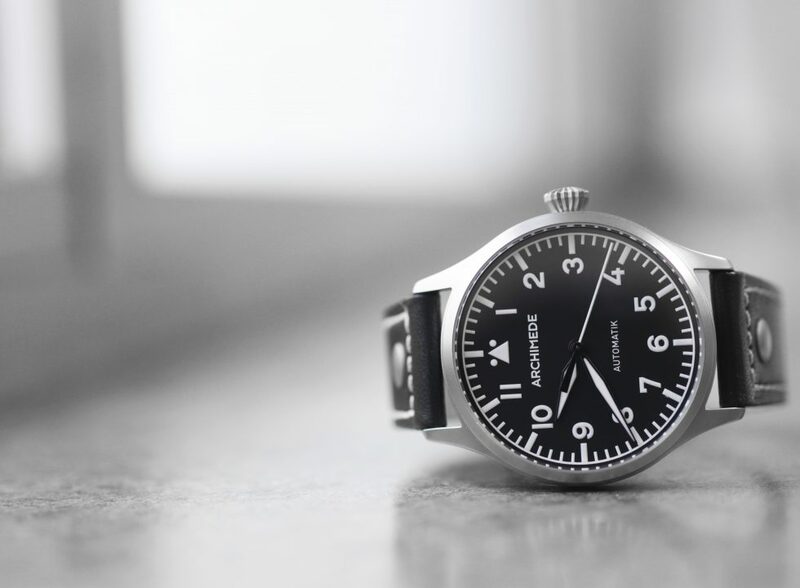 So, it is a mix of classic and complication – Archimede successfully merged both into a single watch.